It is not uncommon to be told during a contact lens checkup at your Opticians, that you have 'blood vessels' growing in your eye, caused by excessive contact lens wear. 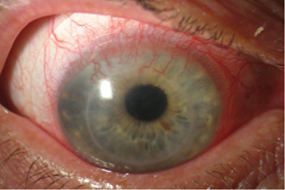 The cornea can respond to hypoxia (low oxygen levels) by growing new blood vessels in an effort to re-supply oxygen. This is a process called neovascularisation. This condition has been known to Optometrists since the 1920's, when it was first noted in a wearers of a contact lens called a haptic lens. Today is is more commonly found in soft lens wearers. Factors that predispose towards this complication include overwear, especially of dirty or degraded lenses, low water content lenses - especially thick ones and tight lenses which trap debris. If the new vessels should enter into the pupil area vision can be compromised. Typically, the individual will be fitted with silicone lenses, something like 1 Day Acuvue Trueye, which will discourage hypoxic (low oxygen) conditions from arising and so prevent any further vascularization. Over time, the vessels can drain of blood and become what are known as 'ghost vessels'. Over several years even these can regress and clear. This is a condition which ideally needs detection early, and needs active management when detected. There is no pain associated with this condition, and it can develop in a soft contact lens wearer without them being at all aware of it. It is one of those conditions that clearly illustrates the importance of regular aftercare.